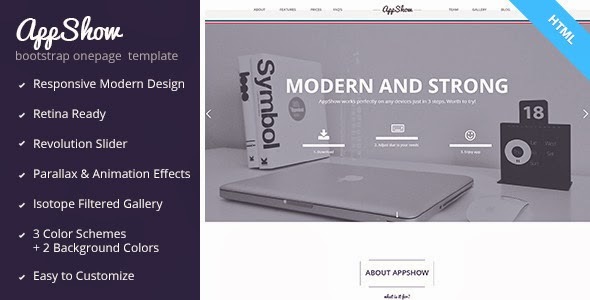 AppShow is a pixel perfect, clean and multipurpose onepage Bootstrap HTML5 / CSS3 Template. It can be used like corporate site and site to present different sort of applications. It’s suitable for webagency as well. It includes 2 different color layouts and 3 color schemes. AppShow is also 100% retina-ready, so you can be sure that your website looks great on all devices. This template is fully editible and can be easily customized due to your needs. Item Reviewed: AppShow - Onepage Bootstrap HTML Template 9 out of 10 based on 10 ratings. 9 user reviews.